Hybrid laptop/tablet manufactured by Microsoft. Released October 2015. Model 1703. Are there any replacement keys for the keyboard? My [1/!] Key and [Ctrl] key are broken. I removed them to clean after I spilled a little juice on it, but as I was putting it in the pins that would lock them into the clip broke. The clip and rubber piece is fix on the actual keyboard but the key itself no longer has anything to "snap" it in place. Is there anyway I can replace the keys? Microsoft doesn't sell them and they want me to send it in to fix for $500. You don't know how lucky you are in the U.S.
For me in Germany $500 sounds like a dream. Here Microsoft charges a flat fee of €685 ($826) for any repair! My [Ctrl]-key has only a fissure, nevertheless they will charge the very same amount as if I would have tossed it out of the window! I have the same problem on my Surface Book. There is definitely a design flaw on the Ctrl key of this computer. It is very fragile and breaks in two along a vertical line in the middle. For a $3000 computer, this is a big problem! Microsoft solution is to replace the full keyboard for 500 euros. They say I use it not properly which is inaccurate. Furthermore, it is my second Surface Book and the previous one did broke in the same place. you're not the only one with two Surface Books and an equal number of broken Ctrl-Keys, just the other day I got an e-mail from a German guy with the same problem! I only got one and it will stay that way. It’s so ridiculous, they even sell the 15” variant with the tiny keyboard, that misses proper navigation keys. This brings me to: "using it wrong". I suppose for Microsoft the Surface Book is a tablet, so using it means using only the touch screen. The keyboard is meant for emergencies only. For me the solution is duct-tape, it may not look nice but it does the job. If this solution does not suit you, you might want to check https://www.quikfixlaptopkeys.com. They offer replacement keys for the Surface Book, at the total bargain price of: $24,99 (plus VAT, import taxes, shipping…). Unfortunately, due to so many broken Ctrl-keys, they are claiming to be currently out of stock. Thanks Mark. I will check the website for replacement keys. I have the same problem, the Ctrl key on my suface book is broken! I search the Ctrl-keys isn't diponible on https://www.quikfixlaptopkeys.com. they are out of stock !! My failure does not come from the Ctrl key initially, the base is grilled, but Microsoft does not want to take it for repair because the Ctrl-key is broken. Not sure if any of you solved this problem already, but I had a similar issue (i.e., spilled juice, removed several keys to clean, and one wouldn't reattach properly - I think a little part broke). 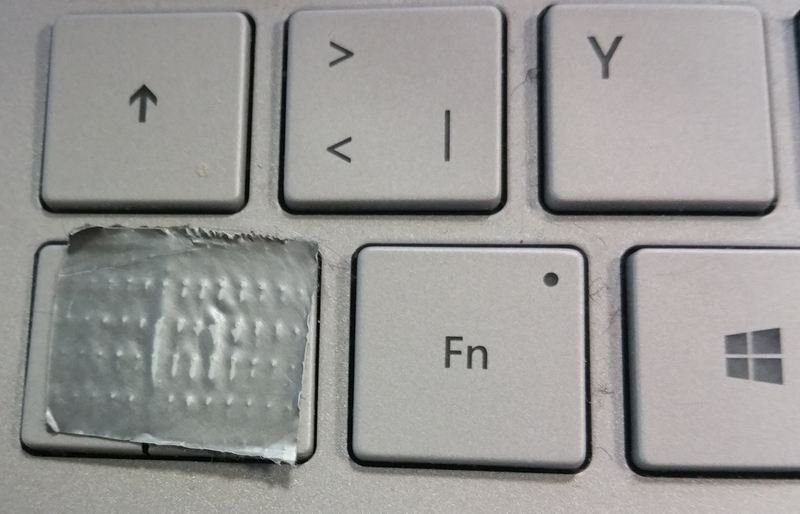 Few websites carry Surface Book keys, but I was able to find a replacement at QuickFix Laptop Keys (http://www.quikfixlaptopkeys.com/?produc...). The part was expensive ($25), and I was wary of ordering from a random website. But the package shipped quickly, and fit perfectly. Not sure who this vendor is, but they were surprisingly reliable. Hopefully the price will come down over time, as the Surface Book becomes more prevalent. Was it easy to replace the keys? I understand the rest of this thread as if removing a key cap may easily break a pin. I would like to say that my Key (the letter T) on my surfacbook 2 split in half. Quickfixlaptop keys sent the item two days before the scheduled date (I was able to track from the moment of placing the order). I live in the UK so I too was weary of booking with a company abroad but I must say the service and the product quality (backlit key) is incredible. Cant tell its a replacement key at all - great service!! The tablet portion can be charged without the keyboard. The middle connector/port where the clipboard connects to the keyboard is the same as the charging port since it is also a Surface Connect Port. 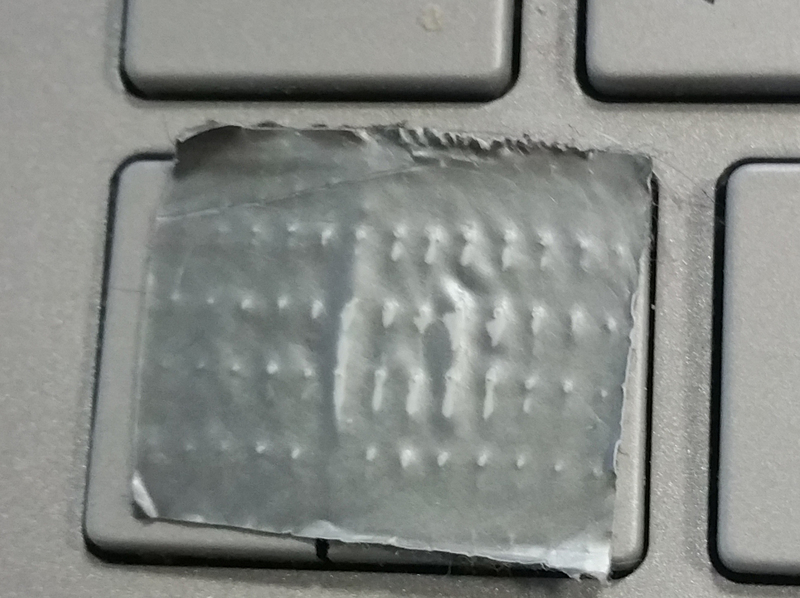 refers to a picture of my, thanks to duct-tape, still working ctrl-key,. Can you send me a larger picture so people could see that it is another keyboard? sure! I just didn't wanted to garble your disk. you might have heard of my motto: "If you can't fix it with duct tape, you don't have enough duct tape". There are no replacement keyboards for the surface book. It comes as one unit, unlike the Surface Pro models. And there are no replacement keys either available for purchase, according to my knowledge. I talked to Microsoft and they will not repair or replace the keyboard. And since the tablet is charged through the keyboard, it will not charge either. What evidence of a bad line of products. Now I have a $2100 paperweight. What's wrong with your keyboard? The "tablet" portion of the laptop should still charge. Have you really never found out you could charge the tablet through the keyboard port? I have a Surface Book too and my keyboard does not work. Seems completely insane that I need to buy a whole new book just to replace the keyboard! I will never buy another Microsoft hardware product. Did replacing the keys fix the spilled juice stickiness? I have spilt coke and 5 keys are affected , I am happy to remove/replace them but only want to do so if in removing the keys I can get to all the sticky parts? No point doing it, to see that the bit the coke got to is behind the key? How did you remove the keys? Do I need any tools or just pull them from keyboard? did you ever clean them? i have same issue. As long as the hooks for the missing key are not bent in then it should be possible to replace. Its a pain in the lower torso to do though. Unfortunately your link only leads to an offer with replacements for the Surface Pro. The Surface Book has a totally different kind of keys.